This is the third part of our Bakfiets Buying Guide. 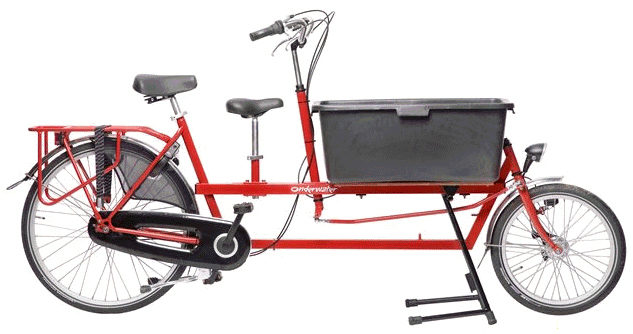 Part 1 gave general tips for buying a new front-loading cargo bike, Part 2 highlighted popular models and this article – Part 3 – offers up some alternatives to traditional bakfietsen. The Onderwater Family tandem, with an optional basket in the middle to carry your shopping or a baby in a maxi-cosi. Next to traditional bakfietsen, the Onderwater Family tandem bicycle is one of the most common kid-carrying bikes you’ll see on Dutch streets. We had a chance to test one and we liked many things about it. For a start, the bike is quite versatile. You can use it from approximately 2 months old by mounting a maxi-cosi in a special cargo box (seen in the picture above) and in total it can easily carry 3 kids, with room left over for shopping. 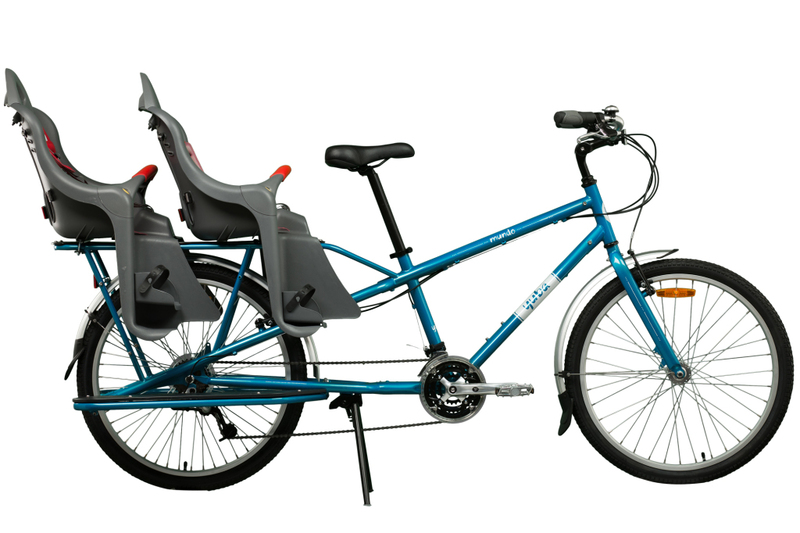 Best of all, this tandem allows kids to cycle along from about 4-5 years of age and for toddlers a child’s seat, without pedals, can be added behind the parent’s handlebar. See a full review on our TravellingTwo bike touring website. 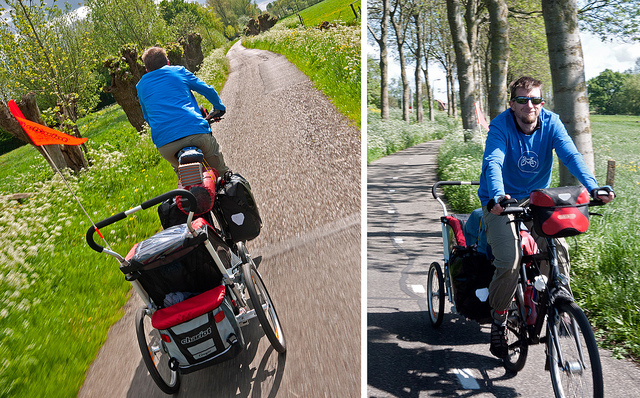 We’ve biked around Europe and Cuba with our first son in a Chariot Cougar trailer. See more on our bike touring website: www.travellingtwo.com. You don’t have to buy a new bike for the purpose (just hook the trailer on to your old bike). The kids are well protected from rain and cold weather and can sleep easily in a trailer. Older kids can be carried on the bike, or you can save the space behind your bike seat for luggage. Most trailers double as a stroller although, because of their width, they can be awkward to get on and off public transport or through narrow shop doors. There are a few downsides as well. A trailer makes it slightly difficult to talk to your kids and, if they’re older, they may prefer to be in a seat on your bike or in a bakfiets where they feel closer to you. You may not want to store your trailer on the street with your bike, in which case you’ll need to hook and unhook it every day to bring it in and out of the house. Parking can be an issue. A bike with a trailer is a relatively long vehicle and you need a big space. You’ll need good mudguards (fenders) on your bike, otherwise the kids might get sprayed with mud and dirt on rainy days. On sunny days, the trailer can become hot. More expensive trailers come with better ventilation options, such as windows which can unzip or which have fabric offering UV protection. In terms of recommended trailers, we’ve personally used the Thule Chariot Cougar for the last 2-3 years. It’s at the higher end of the price range for trailers but very well built and has a good re-sale value. Other common brands include Burley, Croozer and Winther. Try to get one that doubles as a stroller, so that it can do double duty when running errands around town. The Yuba Mundo is an American-made and relatively affordable bike, which can easily carry two kids. While checking out the Onderwater Tandem at Beerfietsen (a great bike shop in The Hague), we were also introduced to the Yuba Mundo bicycle. 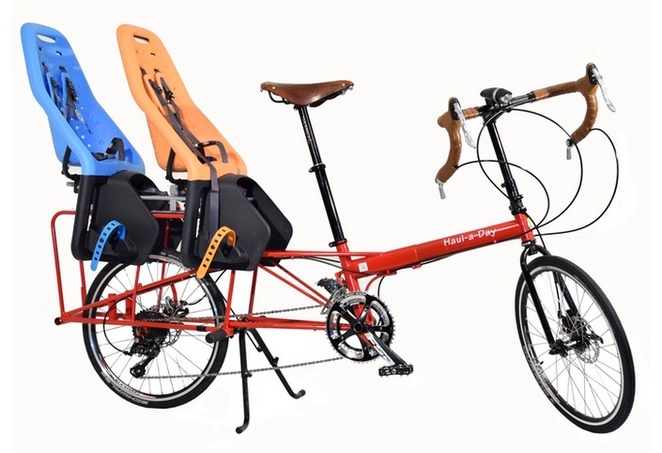 If you have two kids to carry in bike seats, this longtail bike is definitely an interesting option. 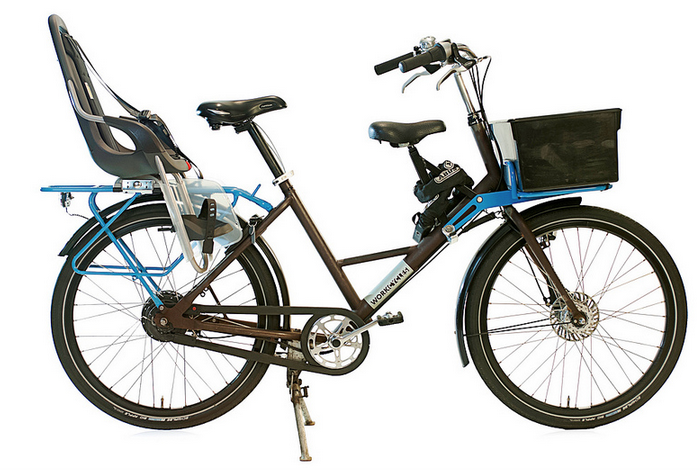 It can lug around 200kg of weight but weighs just 22kg itself (a full 10-15kg lighter than most bakfietsen). The relatively light weight makes it easier to cover longer distances and it’s easier to part, because there’s no big, bulky basket on the front of the bike. In the United States, this bike has a cult-like following. Introduced in 2014, the FR8 is built to carry up to three kids and plenty of shopping. 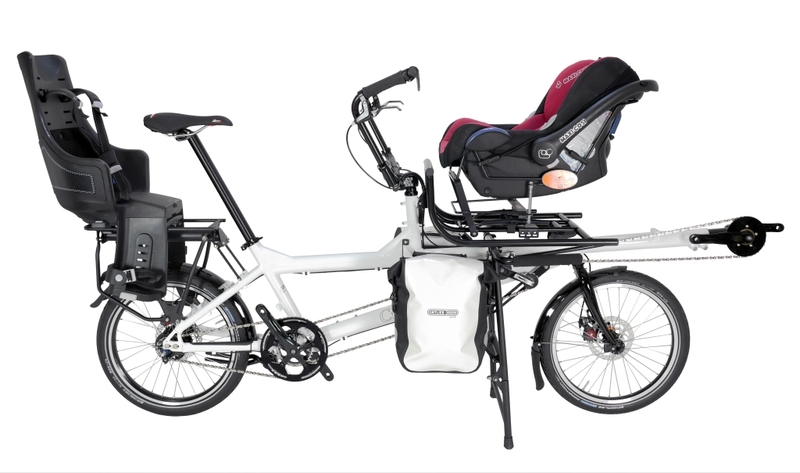 Like the Mundo, the FR8 from respected Amsterdam-based bike builder WorkCycles has an extended back rack which can carry either two kids in seats, or one kid plus bags. Up front, you can add a normal front child’s seat or a “kiddy seat” behind the handlebars. That means up to 3 kids can be carted around on this bike, with a total carrying capacity of 250kg. The UK-made Circe Morpheus isn’t well known (yet) in the Netherlands but for serious cyclists who want a “do-it-all bike” which can handle long tours as easily as the daily commute, it’s definitely worth considering. The possible configurations are (literally) endless. We’re taking delivery of one shortly and will likely set it up similar to the photo above, with a bike seat on the back rack and a maxi-cosi on the front rack. Later, we’ll move our youngest child to the back and put a normal seat with ‘kiddy’ crank up front so that kids from about 4 years old can pedal along. With a normal crank, the bike could also carry two adults (one in each of the normal seats) and a child in a bike seat on the back rack. Several other options are laid out on the Circe website. It’s not the cheapest of bikes but definitely one of the most flexible. It’s a good investment if you want to do a lot of family cycling over the coming 5-10 years and need a bike which can adjust to changing circumstances and riders. A similar bike (but more expensive and, we think, less flexible) is the Hase Pino. Bike Friday’s Haul-A-Day is built in Oregon and is highly versatile. Another “do-it-all” bike is the Haul-A-Day from the American manufacturer Bike Friday. Recently introduced thanks to a successful Kickstarter campaign, the Haul-A-Day can carry up to three toddlers and can be adjusted to suit riders from 120-190cm tall. When not in use for carting the kids around, you can use it as a cargo bike. It’s custom built and available in a range of colours and with numerous accessories. The only catch with this bike is that the lead time to get one of these bikes is rather long (currently about three months). CycleYou (Amsterdam) is the Bike Friday distributor in the Netherlands.